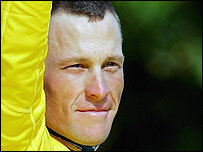 Independent Dutch investigators have cleared Lance Armstrong of doping in the 1999 Tour de France. French sports newspaper L'Equipe had claimed that Armstrong's samples on the 1999 Tour later tested positive. But investigators exonerated him in a 132-page report on Wednesday and blamed anti-doping authorities for misconduct in dealing with the American cyclist. "The report confirms my innocence," said Armstrong, who has repeatedly denied using banned substances. Armstrong said the case amounted to a "witch-hunt" that was designed to "discredit" him. "I have now retired, but for the sake of all athletes still competing who deserve a fair system of drug testing, the time has come to take action against these kinds of attacks before they destroy the credibility of Wada and, in turn, the international anti-doping system." Cycling's governing body, the UCI, said it would make a full statement after studying the report. L'Equipe reported last August that six of his urine samples from 1999, when he won his first Tour title, came back positive for the endurance-boosting hormone EPO after they were retested in 2004. The UCI then appointed Dutch lawyer Emile Vrijman last October to investigate the handling of urine tests by the French national anti-doping laboratory, known as LNDD. But Vrijman, who headed the Dutch anti-doping agency for 10 years and later defended athletes accused of doping, said on Wednesday that his report "exonerates Lance Armstrong completely with respect to alleged use of doping in the 1999 Tour de France". The report added that the UCI had not damaged Armstrong by releasing doping control forms to L'Equipe. But it said Wada and the LNDD may have "behaved in ways that are completely inconsistent with the rules and regulations of international anti-doping control testing", and their actions may also have been against the law. Vrijman said the laboratory had analysed the samples only as part of a research programme for the detection of EPO, so there was no way of confirming the tests. "If you look at how the result was obtained it was so different from the analysis procedure required by Wada... it doesn't even qualify as a finding," he said. "It may suffice for research purposes but as a valid doping result - no way." He said samples may be used in research programmes only on the condition that all information tracing them to an individual is removed, but this was not the case. Vrijman added: "Sometimes with doping cases you can say it was a technicality. "These are not technicalities, these are fundamental issues which should have been done completely differently." However, the UCI (International Cycling Union) and the World Anti-Doping Agency (Wada) both criticised Vrijman for making the report public. "The World Anti-Doping Agency expresses grave concern and strong disappointment," said an official Wada statement. "Wada is not in a position to comment at this time other than to state that elementary courtesy and professionalism would have dictated that Wada should have been provided with a copy of the report before interviews were given to the media." The UCI added in a statement: "Still waiting to receive the definite version of the said report written by Mr Vrijman, the UCI underlines its deep displeasure with regards to the regrettable development of this case."